I really have been obsessing over this bedding situation from TOAST . So perfect for fall and winter. 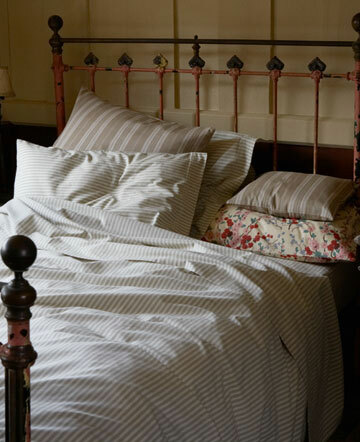 I love the combo of the old fashioned, neutral ticking with the floral. Oh, if only money were no object, I could buy all of the things on my list. Sigh. 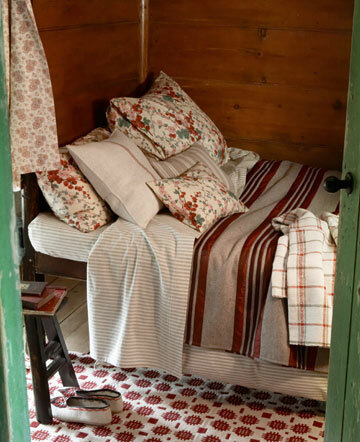 I think I'll try to get some cheap flannel ticking sheets and a vintagey graphic floral to accent it, and find an old soft woolen blanket and just try to recreate for cheap. Not that I'm really going to get any sleep or spend any time in bed in the winter months this year! Maybe bebe will quickly start sleeping through the night! A girl can dream! I’m so glad you have some new posts to read! Its always fun to see what you’re up to. that bed looks so cozy! i have an old cast iron bedframe in storage at my parents, and i’m a bit irked that its a full and not our queen size. i would have put it to good use already. those catalogs are very dangerous.